What is the WhatsApp function? The WhatsApp function allows your users to drop you a WhatsApp text, if they prefer that compared to an instant or scheduled callback. By adding WhatsApp, you provide an additional avenue for your visitors to contact you. To enable the WhatsApp button, you'll need to add in your WhatsApp Contact Number. The WhatsApp button is located under the "Message Us" tab. If a user clicks on the "Chat with WhatsApp" button, they'll be sent to a direct WhatsApp message with the number that is registered behind the button. Navigate to "Widget Settings" > "Message Page". You'll see the "WhatsApp" section. 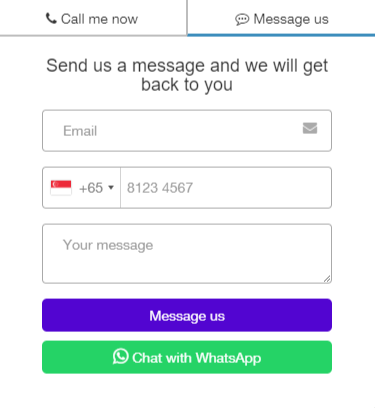 Input your WhatsApp contact number and click Update.